Scrimshaw is engraved and decorative artwork done on whales teeth or whalebone. Whalers passed idle time on whaling ships by creating this artwork. Whaling ships often set out for trips that could last years, so many hours were often spent on creating these artworks. 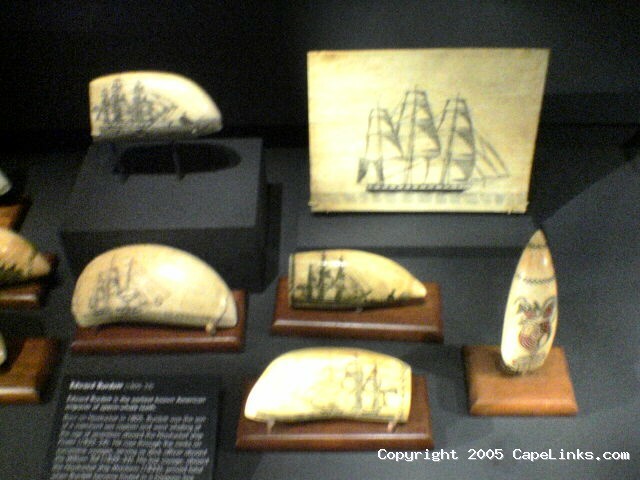 The pieces shown here are from an exhibit at the Nantucket Whaling Museum. This image has been viewed 15795 times and 1 person has commented. You may leave a comment about this image. You can also view more General and Cape Cod images or learn more about Cape Cod.